WordPress is one of the most well-known content management systems out there. It’s beneficial for every type of user, whether you’re brand new to the online world or are a seasoned vet. WordPress is such a powerful platform that people often overlook what seems to be “the little things.” These “little” mistakes can snowball into bigger problems if you’re not careful. 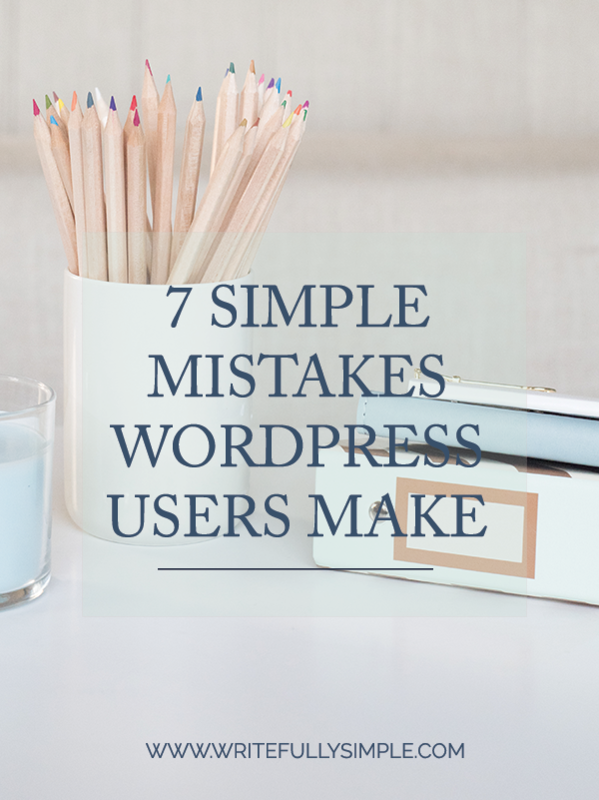 Here are 7 Simple Mistakes WordPress user’s make and how to fix them. The internet is a beautiful and powerful tool when it’s working correctly. Having a website is a big responsibility if you want to keep it up to date and functioning right. WordPress, just like every other kind of software, has to be updated. The head developer’s behind WordPress don’t just kick back and roll out updates because they’re bored. Updates usually have reasons behind them. Updates are needed to keep up with efficiency, speed, and security. They’re also needed to keep up with the fast-paced technology world. Ignoring updates is one of the most common WordPress mistakes I see. I’ll log into a client’s site and I see the orange circle with a double-digit number in it….”17 Updates Available.”My heart starts to break.My eyes start to water. Okay, that all might be a little extreme hahahaha but it basically looks like a ticking time bomb when you see A TON of updates being ignored. It’s like that website’s foundation is ready to combust and one wrong move could send the site into a breakdown….which could be detrimental if you don’t have a backup (more on that below! )Usually, updating WordPress or a plugin is no big deal. The biggest update problem comes when you wait awhile to update. If you’re jumping from version 3 to version 15…..you run a higher risk of breaking something within your website. So, please, keep your site managed! When you start using WordPress, you have so many things to think about. Most people are worried about figuring out HOW to upload images in general, often forgetting to optimize them. Every image that shows on a page has to be downloaded to your user’s browser. If your image is HUGE then it takes longer to load, which is frustrating for the user. Before you upload an image to your website, make sure that you’re saving the image to the exact size you need it. (example: If you need an image for your sidebar and you know your sidebar is 300px wide, then resize that image to be 300px wide before you upload it to your website). Don’t leave it up to WordPress itself to resize your image because that makes your browser load that images twice; the original size, then the WordPress resized size. Run your image through an image optimizing tool too! Free ones like com or Kraken.io work like a dream. Using the WordPress default “Admin” as your username for your website is a huge security risk. Hackers could easily break into your WordPress website because they know that a lot of people don’t bother to change this. Sometimes when you install WordPress, it automatically sets your username to “Admin” but you can easily change this. Login to your WordPress dashboard. Create a new user and make sure that you change the role to Administrator. Change your username to something unique. Maybe toss in some letters, numbers, or special characters. (Just don’t make it so unpredictable that you forget it! That would defeat the purpose. )-Logout of your current account. -Log in again, under your new administrator account that you just made. -Once you’re in your WordPress dashboard, go back to the user’s tab and delete the old “admin” account. -Now, when you log in to your website, use that new administrator login that we created. What is a permalink? It’s the link to that specific web page or blog entry. Each new WordPress page or post has its own unique permalink. WordPress’ default is this: “MariahMagazine.com/?p=123”…..so, basically mumbo-jumbo. Not only does that ugly permalink’s random characters and numbers confuse you and your users, it also confuses search engines. For sanity and SEO purposes, I always recommend setting up your permalink structure to “Post name” so that it reflects the title of your page or post. Now, when a search engine robot comes to crawl your page, it can see in your permalink a few keywords and figure out what your page content is about. -Don’t forget to save your changes! -As cool as that plugin might sound, do you really need it? -How many reviews and stars does it have? What do they say about the plugin? -How many downloads does it have? -Is it compatible with your version of WordPress? -When was the last time it was updated? -Do the developers answer the support questions? Make sure that whatever plugins you’ve decided to download, don’t slow down your website. That plugin could create the COOLEST feature on your pages, but if your site takes too long to load, no one is sticking around to see it anyways. User’s don’t realize how big of a mistake this is until it’s too late…and this is the last kind of headache you want to have. What happens if your website gets hacked? What if the hacker destroys everything…or deletes it all? What happens if you download a crappy plugin and it ends up breaking your website?Now what? Do you start from scratch? I would never wish any of these on my worst enemy. Recovering from a hacked or broken website without having a backup is like trying to rebuild your house after a fire. The internet isn’t perfect. It’s better to be prepared than to wish you were. Schedule regular backups for your website. I always suggest a minimum of once a month, but you can absolutely do one 1x a week. A lot of backup plugins allow you to set this up automatically, so it backups your website without you even having to think about it. -You’ll see the Tagline box. It’s basically the same thing as your sample page, but it’s a post. Go to “Posts”, hover over the page title and click “trash” to get rid of that. Shows you how a default comment is laid out. Go to “Comments”, hover over the page title and click “trash” to get rid of that. A lot of WordPress user’s don’t realize they left these things up until Google starts showing them within their website’s search results. It’s super easy to fall into the trap of these WordPress mistakes, especially if you’re new to the website and blogging world. The good thing is, is that they’re super easy to correct! Mariah is a web designer and developer that specializes in WordPress and Squarespace customizations. She loves working in collaboration with other bloggers, creatives, and small business owners to help make their website and online presence as powerful as possible. She blogs over at MariahMagazine.com where she teaches readers how to improve their website, enhance their social media, and take advantage of bloggers and entrepreneur tips and strategies. Connect with her on Facebook, Pinterest, or Instagram! This is so helpful!! I’m currently switching over to word press and this has given me a good idea of some things to work on. Hi Emily! I am so glad this was helpful for you! If you have any questions while switching things over please feel free to reach out! I’m more than happy to help you out however I can!